Quick succotash recipe helps you enjoy corn and beans in a jiffy. Quick succotash recipe helps you enjoy corn and beans in a jiffy. Provided they are fresh from the garden, neither are likely to give you a glycemic reaction of concern. This page was last updated by Bernard Preston on 19th December, 2018. A dozen pods of lima beans. Optional is a clove of garlic and perhaps a jalapeno chili. But, if you are diabetic, the onus is on you to test your blood glucose 30, 60 and 120 minutes after starting the feast. Does it go above 9 and has it returned to normal within two hours? A glucometer is an inexpensive item; every person who is obese or suspects they may be prediabetic should have one, and regularly test what they are eating. It's the difference between life and a stroke or heart attack. Fresh young mealies, white rather than sweet corn, as we call them in South Africa, and lima beans combine the very best of a medium GI starch and vegetable protein dinner. One ear of corn and about a dozen pods of limas is all you need for a delicious meal for two. Both corn and lima beans have a relatively long growing season, so considerable patience is needed. What affirms me, is the need to increase the vegetable protein in our diet; the World Health Organisation warns about the dangers of too much meat and dairy. With one in eight women getting a breast malignancy, it's inappropriate to think you have only to make some cosmetic changes to your lifestyle; it doesn't only happen to other people. In addition, the lignans in corn are strongly associated with a lower risk of cardiovascular disease and breast metastases. If you keep chickens they will simply adore any excess, or deformed corn and beans, and respond with delicious eggs, high in omega-3 fatty acids. That means less work for the chiropractor, surgeon and rheumatologist. Do your level best to keep us out of business. Quick succotash recipe really is only for those who are determined to get back to the food that our grandmothers once served, and have an aversion to the rubbish dished up today in so many homes; no wonder we are so ill, have so much pain and are so obese. If you don't care about these values, or are unwilling to make the time, then this Dr Bernard Preston site isn't for you! Do you have a real desire to take virtually no medication, and consult your doctor less than once a year? Then it's time to start growing your own veggies; start with pole beans, rather than limas, and ordinary spinach, or Swiss chard. They are the easiest, and require very little care. 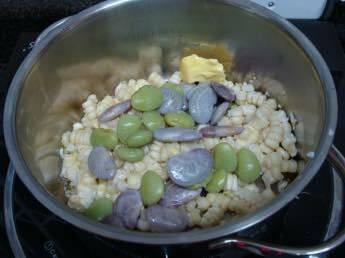 Quick succotash recipe is very simple if you grow your own limas; or you can cheat and use canned butter beans, but check first how much salt, sugar and preservatives they are loaded with. This is not banting food, but it's interesting that I've been enjoying fresh corn from the garden all summer long, and we have legumes daily from our patch, and not put on one pound. It's all about the balance of the meal, and when those starches were reaped; eat plenty of salads, veggies and fruit and you won't have a problem with your weight. It was interesting chatting recently to a diabetic patient who informs me that new potatoes have no effect on his blood sugar, but those dug weeks ago and have come from cold storage he has to avoid. Get your starches as soon as possible after being reaped to the pot. It's the refined starches that are the problem in the main. Having picked and shucked the ear of corn, and podded the lima beans, it takes about twenty minutes from start to finish to complete this quick succotash recipe. Drop the lima beans into a little hot water and bring back to the boil for ten minutes; with the lid on. 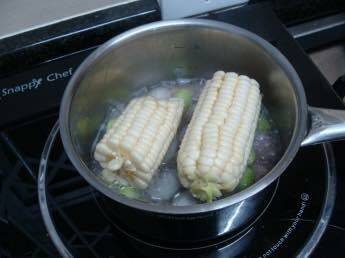 Plop the ear of corn into the pot, on top of the beans, and bring back to the boil for another five minutes. Rescue the cob, allow it to cool and, using a sharp knife, slice off the pips. Meantime add a large dollop of butter into another small pot, heat and drop in the garlic and jalapeno. As soon as it's sizzling, scoop in the beans and corn pips, add a teaspoon of water and heat it through. Add salt and pepper and grub's up. How to grow corn is not a lesson that any country bumpkin will need, but perhaps you're an urban dweller like me with a large vegetable garden. Not many foods beat a fresh ear of corn straight from the garden, either in terms of taste or satiety. Three days old from the green grocer and you have something very dull. Growing limas may be more mysterious, but in fact it's no more difficult that pole beans; they just have a long growing season, and you have to be patient. I prefer the pole beans as they are more prolific, easier on the back to pick and the hens won't get to the pods before you do. 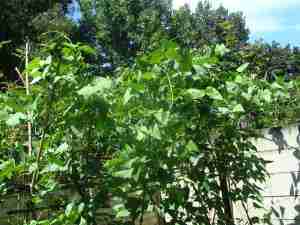 Plant them along a fence or on a wigwam of canes. Our quick succotash recipe is traditional American fare; it's definitely allowed on our modified Banting diet; I haven't put on an ounce whilst enjoying it through this summer, but then I know all about exercise and cholesterol and the virtue of the eight coloured foods per day menu. That means plenty of salads and fruit, and veggies that include the magic of beets and butternut. If you're still on the black and white diet, it's time to step up to colour. In South Africa I've never seen them in the green grocer. You have to grow them yourself. Another variation of this gem is gigantes butter beans recipe. 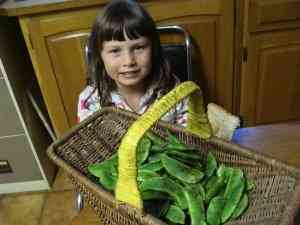 Growing lima beans requires a hot summer, plenty of water and a large garden; and a good deal of patience. They require a long season to mature. But if you want to make your own quick succotash recipe, like grandma did, then you'll make the time, right? 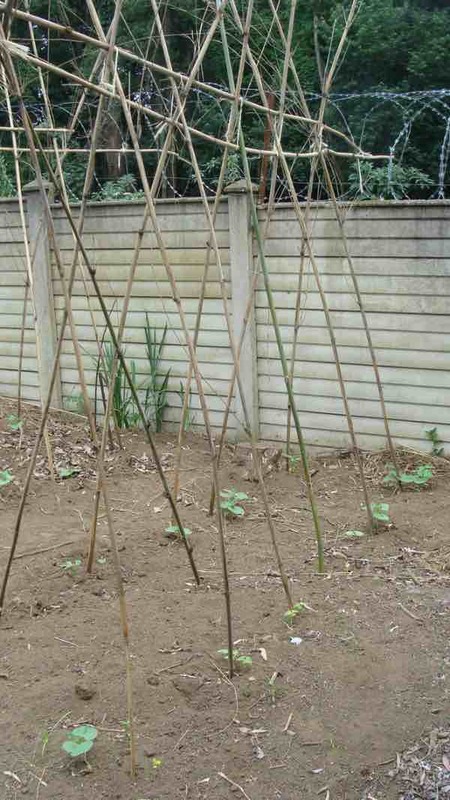 I used to grow them on regular vegetable garden fence, but it doesn't allow easily for crop rotation; we now get far less disease and better yields by using a vegetable garden trellis, easily made from bamboo poles. More thoughts on lima beans from WHF. 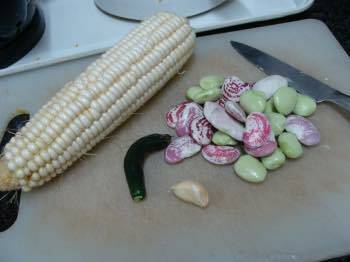 How to grow corn is just as easy as growing lima beans, but the season is slightly shorter; repeated plantings are necessary in spring and early summer to make sure they ripen at the same time as your limas; that's if you want to make this quick succotash recipe. If not growing corn for your quick succotash recipe then just enjoy them every day for lunch; it's interesting that you'll have less desire for bread then; they provide plenty of the complex starches we need. And if you keep hens, then they'll just love your quick succotash recipe left overs; they need plenty of vegetable protein to produce the golden yolked eggs we love. Permaculture is the study of how to work with nature rather than against it; organic gardening is just one feature of it. It encapsulates the philosophy that we have the responsibility to leave a habitable planet to our grandchildren, rather than the silent spring that's looking all the more likely. It starts with small things like planting a seed; eventually the subject may grab you, as it has us, and you'll build a solar generator on your roof and start collecting rainwater. One step at a time; start with a few spinach plants, and pole beans. Meantime read about the wonderful phytonutrients lutein and zeaxanthin in fresh sweet corn at world's healthiest foods. If you are insulin resistant or frankly diabetic then grasping the meaning of simple vs complex carbohydrate is vital. Bernard Preston is a self confessed healthnut. 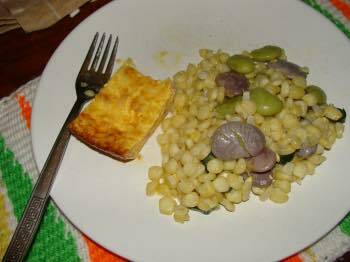 Determined as far as possible to avoid the side effects of drugs, through exercise and proper nutrition, such as growing lima beans and fresh corn, and chiropractic adjustments for ailing joints, he aims for a life without medication; this quick succotash recipe is just one of many from his slow food, made fast menus. It is of course for some a pipe dream, but a lifetime commitment to better health and exercise means that neither he nor Helen take any medication, no mean feat as they approach seventy. This quick succotash recipe, rich in vegetable protein and healthy corn is typical of the food they enjoy in late summer. Whilst most gluten sensitive folk can eat the corn in this quick succotash recipe, all of us should really have some familiarity with the meaning of gluten, especially if bread gives you a bellyache or diarrhoea.